1 manual, 4 speaking stops, no pedals, tracker. 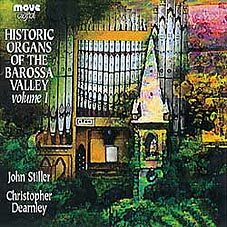 Daniel Heinrich Lemke is the best known Barossa Valley organbuilder. He was born in 1832 and migrated from Germany to SA in 1853. He worked as a teacher and built organs in his spare time. 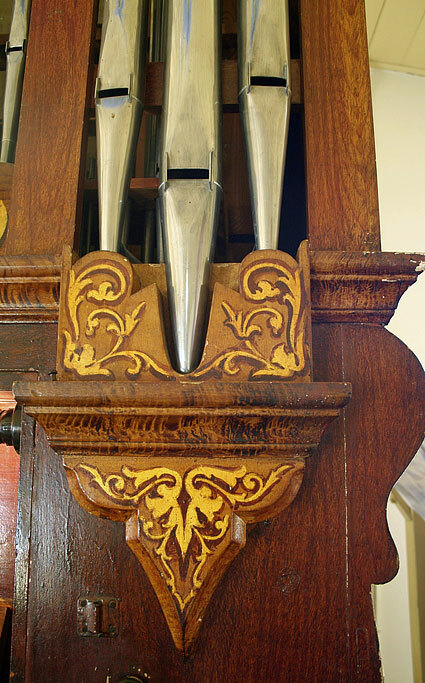 Four are known to exist today - all in the same style with four octaves of keys on one manual with no pedals and foot treadles to pump the wind. The specifications were the same and none of his stop knobs had stop names on them, only pitches. He made his own wooden pipes but imported the metal ones. 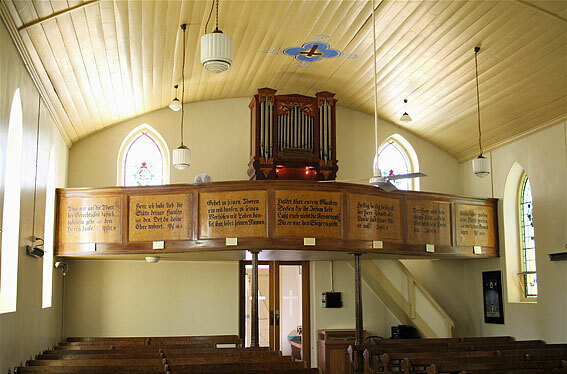 The organ in Holy Cross Lutheran Church, Gruenberg was built by Lemke in 1871 (according to an inscription on a wooden pipe) and is the earliest of his existing organs. 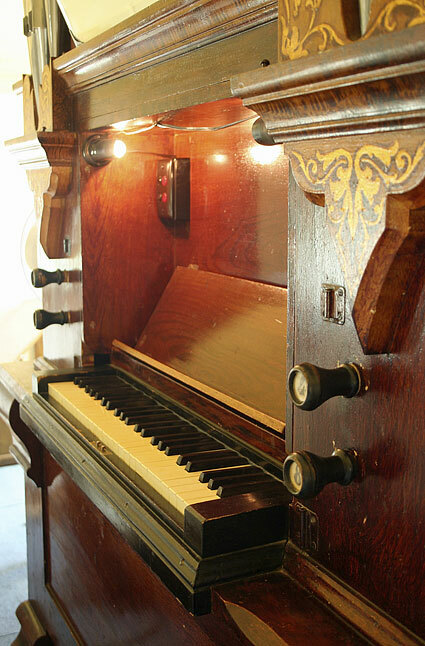 According to a newspaper report, it was his third organ. 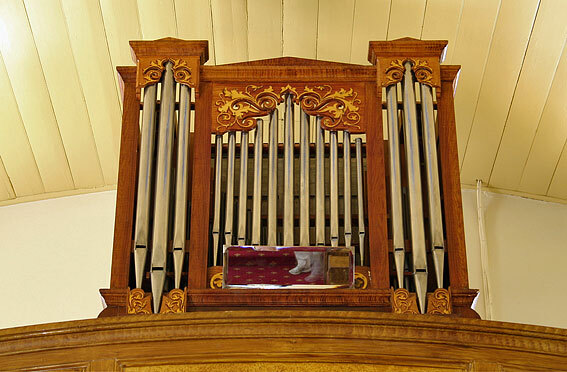 The organ was formerly blown by foot treadles but an electric blower was added in 1966. Specification from the 1986 OHTA Conference booklet. Stop knobs have no names, only pitches. Can still be foot pumped. Evidence under the 2' toe board indicates Robert Mackenzie may have supplied and voiced the metal pipework. Three families from Silesia settled the land around Gruenberg in 1853. 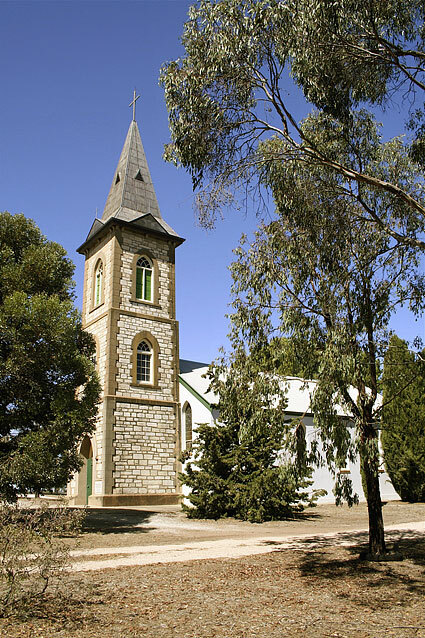 The following year, a school was organised and Pastor Kavel came from Tanunda for services in the settlers’ homes. 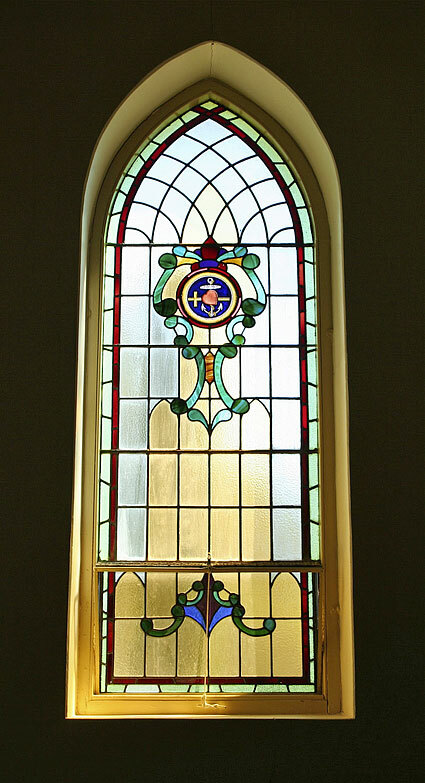 Land was acquired in March of 1859 and the first church/schoolroom constructed. Daniel Lemke became the teacher in the school in 1860. 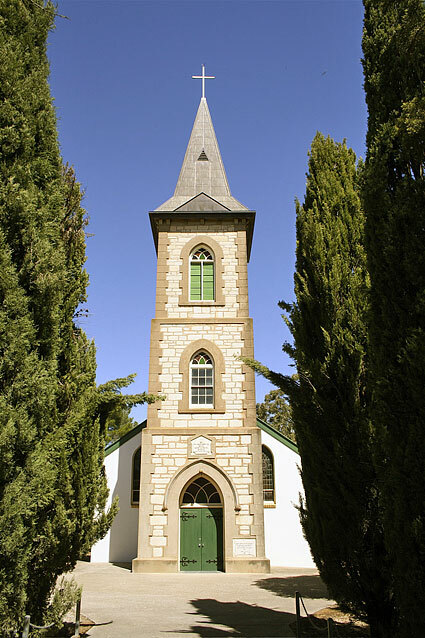 In 1864 it was resolved to build a new church and the body of the current structure was dedicated on 16 October. After teaching at Eden Valley, Lemke returned to Gruenberg in 1867. 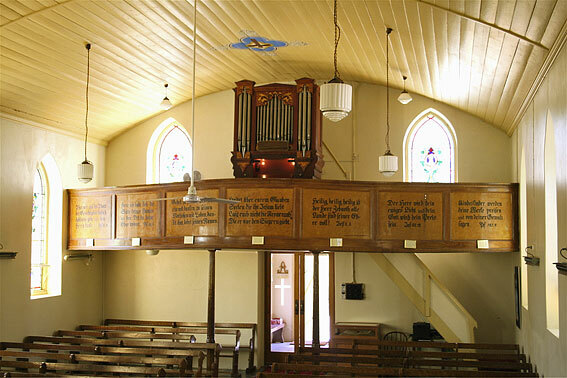 The organ was placed in the church in 1871. The story of Daniel Lemke can start with Gruenberg. The Lemke family had, in fact, arrived in 1855. They settled to farming on land in the Barossa Goldfields before the rest of the family moved on to the western districts of Victoria. A single man, Daniel stayed on, eventually managing to sell the land before being called to teach at Gruenberg in 1860. 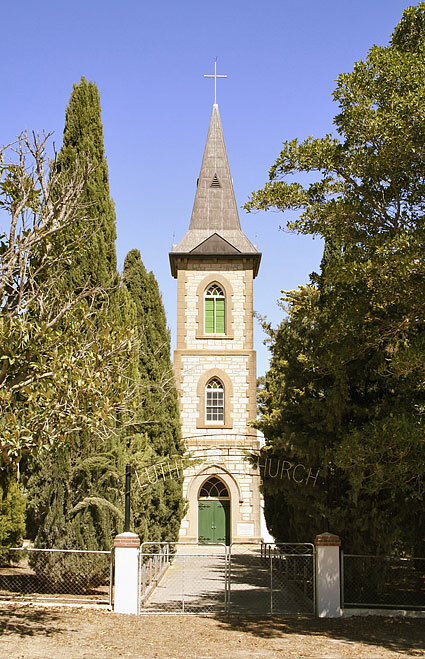 He married Caroline Sagenschnitter, a farmer’s daughter of Parrots Hill (Gnadenberg) in April the following year, his first child being born in February 1862. He was called to Eden Valley as the first teacher for its school in September 1862 where he stayed until 1866. He returned to Gruenberg in 1867 to teach before turning once again to farming in 1880. Four instruments built by Lemke are extant, all of similar construction. 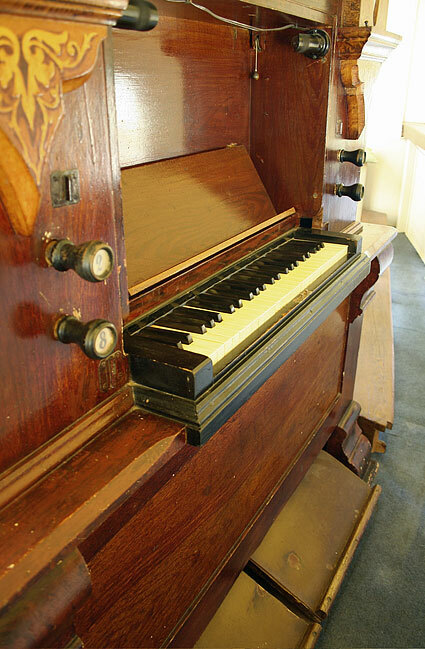 Lutz implies Robert Mackenzie may have worked on this instrument, though what was done is unknown.4 Apart from the electric blower added in 1966,5 this organ appears to be entirely original in form. From Stiller’s documentation, like the organs at Ebenezer, Point Pass and Frankston in Victoria, the metal ranks are not Lemke’s construction. The keyboard has a short compass of 49 notes. The pitch is given as a1 equal to 449hz at 28oC with a wind pressure of 30 mm (circa 11/8 inches). Pitch designations only are given on the stop labels. It has 172 pipes and is blown either by treadles or electric blower. It is located in the west end gallery. 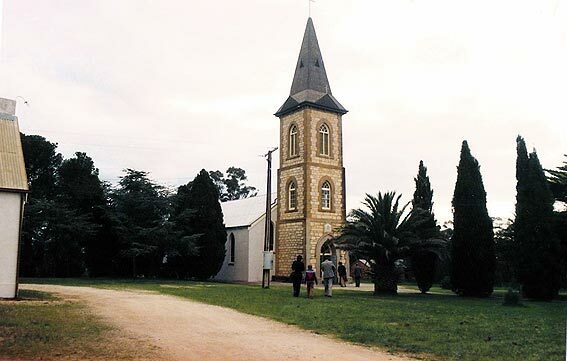 In 1964, a complete renovation of the church was undertaken for centenary celebrations and extensive painting was undertaken. 25 years later the ceiling was repainted. Under inspection, faint outlines, previously covered, were noticed. These symbolic designs and the German lettering on the front panels of the balcony were faithfully restored in 1989-90. 3 Lutheran Archives pamphlet, Holy Cross Lutheran Church Gruenberg. 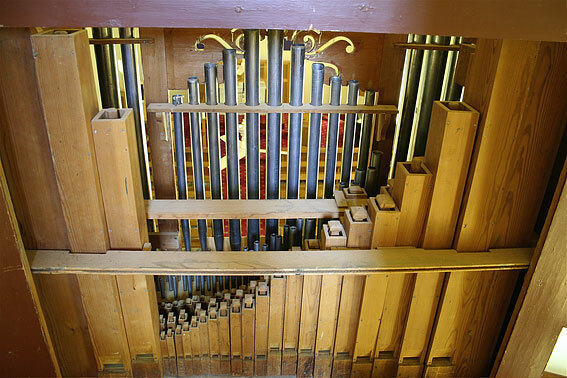 Note, when documenting the organ in 1979 Stiller dated the organ c.1874 on the basis of newspaper wrapped around the bellows weights using the South Australian Chronicle dated 6 December 1873. Stiller, J., Documentation Holy Cross Lutheran Church Gruenberg Organ, 21 December 1979. 4 Without deciphering it, Lutz refers to a pencilled note on the soundboard implying a connection with Mackenzie: The Work Praises the Man, p.22. 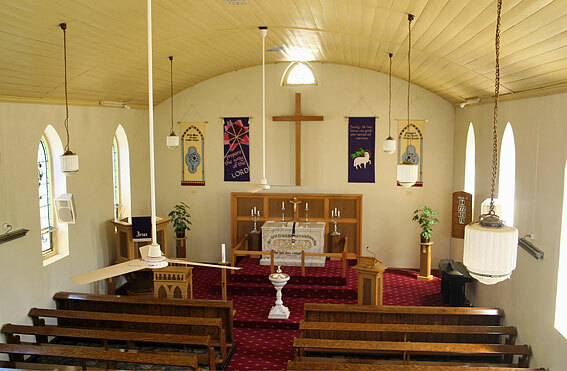 See section on Bethany with regard to the discussion concerning Lemke’s metal pipework. 5 Supplied by L.S. Waters; Stiller documentation, op.cit., note 1, letter L.S. Waters to Murray Klemm 18 November 1966. Note all records of Waters were destroyed, so any other work from this source cannot be verified from company records.